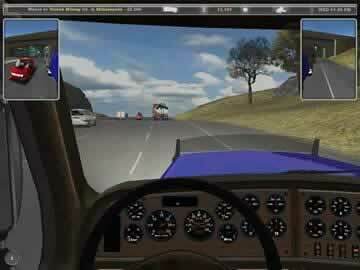 18 Wheels of Steel: American Long Haul Game Review - Download and Play Free Version! Upgradeable trucks let you make deliveries quicker. Visiting cities in the U.S.A., Canada and Mexico. Lifelike surroundings contribute to the game's realism. Contracts allow for better pay. Long hauls can be very time consuming. Traffic laws can be hard to follow. Take your big rig on the highways of America! North America's open roads await! You ain't working for the Man any more! 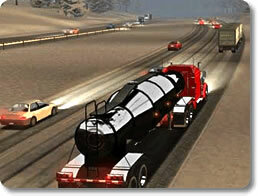 In 18 Wheels of Steel - American Long Haul, you're the owner of your own trucking business and you call the shots. Build your empire one rig at a time to dominate the roadways and outbid the competition. Can you handle the pressure? Your American Dream starts behind the wheel of your own big rig. Dominate - Move it better and faster than your competition. Build your reputation coast to coast as you long haul across 48 states, Canada and now Mexico! Grow - Build your business and add rigs to your fleet. Own up to 37 mammoth machines and trailers. This installment of the 18 Wheels of Steel (18 WOS) series puts you back behind the wheel of an enormous 18 wheel semi-truck. 18 Wheels of Steel: American Long Haul lets you get a taste of what life behind the wheel is really like. Following the rules of the road is a must since you will be fined heavily for any infractions you commit. From hitching your trailer to dropping it off no detail is left out. Free play is the only way to experience this edition of 18 WOS. You can adjust the difficulty setting from easy to hard. The differences between the difficulty levels is how much money you start with and how accurate you need to be when positioning the trailer to drop off. In easy you start with $50,000 and the trailer need not be properly aligned. Medium gives you $20,000 to start and trailers need to be fairly accurately parked. Finally, hard mode gives you $20,000 cash and a $100,000 debt to pay off, and trailers need to be parked very accurately. Other than the starting features and trailer parking not much changes with the difficulty rating. Parking trailers can be hard at first but with practice becomes quite easy. After paying off the initial debt, hard mode doesn't seem much more difficult than easy mode. To start out you choose a load, attach the trailer and figure out how to get to your destination. There is a wide variety of loads to choose from such as construction equipment, food, gas, and more. Loads will have a specific location and an amount you will make for delivering. Make sure to choose loads that are profitable because, if you spend more on gas than you get for delivering you've wasted your time. After you have made some money you can upgrade your truck. You can purchase things like new engines, transmissions and brakes. Upgrades can make your truck faster and allow you to make your deliveries quicker which makes them well worth the money. 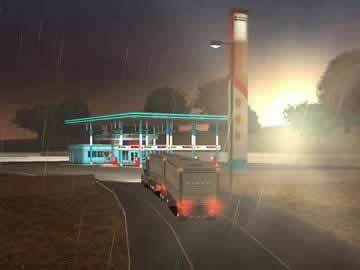 The graphics, like in all the 18 WOS games, are phenomenal. Cities are modeled to reflect how they are in real life as well as the local vegetation. The trucks are modeled very well both inside and out. The interiors include rear view mirrors and even a CB radio to communicate with other truckers. Highways are all named correctly and include signs to tell you how to get to the city you need. Weather plays a factor in driving conditions. When it is snowy you will have to slow down to avoid slipping. The detail adds to the immersive effect of the game. There are some downsides to the game. Traffic laws can at times be impossible to follow. Stopping at red lights in a moving truck with two trailers is not a quick thing, so on occasion you will run a red light. This infraction will cost you heavily. Also the large amount of time it requires to travel can get excessive. To travel from one side of the country to the other can involve several hours of driving. Without saving and coming back to it later this can get very boring. 18 WOS: American Long Haul provides and awesome truck driving experience. Seeing the varying landscapes from Mexico all the way up to Canada gives you plenty to explore. The variety of loads and locations means you will never have to haul the same thing to the same place twice. With all the features in this game you will have endless hours of entertainment. Throw on your truckin' hat and hit the road.